There was NO Matrix on the floor of the 2013 NYC auto show. Toyota's cars look very dated. However you should of seen the 2014 Corolla. Very slick! CAMOGIRL wrote: Well, isn't the matrix just a corolla hatch anyway? Why can't we get that in NA? 2007 Vibe 1.8L Automatic 185K, B&M 70264 Transmission Cooler, Custom 2" hitch receiver. cythraul wrote: Why can't we get that in NA? They say "The world's most popular small car." According to Wikipedia, it's a rebadged Auris..
Toyota in Australia and New Zealand launched the E170 series Corolla sedan in late February 2014. An equivalent hatchback model is also retailed under the Corolla banner, but this is actually a rebadged Auris released earlier in 2012. For the sedan version, which is imported from Thailand, there are three different variants: the base Ascent, the mid range SX model, and the flagship ZR. The Corolla sedan and hatchback (Auris) were together in 2014 the top selling car in Australia. 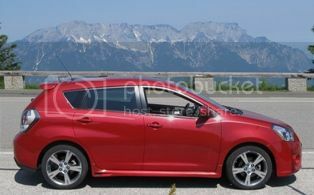 It was not sold in North America, as the larger Toyota Matrix had taken its place in the lineup prior to its discontinuation in 2014. So it's settled. I'm moving to Australia. I'm sure their polling whether to rebrand the segment or to keep the name. It will go on the corolla platform so not much would change. With a 1300kg (2866lbs!) towing capacity with braked trailers, I would not hesitate an instant to buy it. I read in USA Today that sales of the new 2016 Honda HRV are impressive. I checked one local dealer's inventory and all he has are AWD. MSRP's are no more than what they were for the 2009-10 Vibes. jake75 wrote: I read in USA Today that sales of the new 2016 Honda HRV are impressive. I checked one local dealer's inventory and all he has are AWD. Good news tho, I found the NA Auris! The question is: why try to resuscitate Scion while robbing this car from Toyota's lineup? Nice find! Unfortunately, north of the 49th parallel, it's not available. Not available yet, it's coming in the fall. Yah right, start selling it outside Australia and we'll see. So it is the best selling car but only in Australia. No need. The Auris is coming to NA in the form of the Scion iM. Due in the fall. I think it look pretty good. The styling isnt that bad and I like the interior. however my 03 Vibe gets just as good MPG and its a 12 year old car. Scion could have done better. As fas as funtionality why buy the IM if there are cheaper cars out there that are just as good. I wonder if under Toyota the iM will be offered in multiple trims? I think the iM is a decent car but its lack of options was a big negative in my book. RRich89 wrote: I wonder if under Toyota the iM will be offered in multiple trims? I think the iM is a decent car but its lack of options was a big negative in my book. Well for starters I really like the sunroof on my '06 Vibe and was disappointed that the iM didn't offer one also I'm not seeing foglights (maybe a dealer installed extra?) which for me are a necessity. I'm also thinking of treating myself to heated seats, remote ignition, leather/leatherette seats and a power driver seat with my next car; all of which the iM does not offer. If the Toyota iM would offer some combination of those features I would consider it. This is all at least a few years down the line for me so time will tell where Toyota goes with the iM. I really wanted to like and buy the iM, but I simply don't fit. The roof is lower than either first or second gen Vibe/Matrix, and it doesn't even have a sunroof. I hit my head while shoulder checking. And the interior feels crammed. Also the CVT is goofy with simulated shift points that add no value whatsoever. MacGyver wrote: I really wanted to like and buy the iM, but I simply don't fit. The roof is lower than either first or second gen Vibe/Matrix, and it doesn't even have a sunroof. I hit my head while shoulder checking. And the interior feels crammed. Also the CVT is goofy with simulated shift points that add no value whatsoever. I feel the same way about the iM. I hit my head upon entry, and I agree that it's quite cramped compared to the Vibe. I really love the high roofline of the Vibe for a variety of reasons. I guess whenever I move to a newer car, I'd have to upgrade to the SUV level if I want plenty of space? Owner of the first official "Brando-mobile", the "Silver Streak". 2003 Base Vibe, FWD. I won't be buying it either. They don't make it in bare bones, no AC and power nothing like my Vibe. A shame really, I really like the look. I'll look into the Cruze hatchback for 2017, hopefully they'll offer it in a base manual L model like the sedan version. The iM is really beautiful ... I saw one in "Electric Storm Blue" in the dealer showroom the other day. But alas, it's not for me. 1.8 liter only, no leather option, no sunroof ... I won't be buying one.